Just a quick roundup for you guys today, as Kristen and I are running a half marathon together this morning… in handmade and rather amusing activewear! I’ll be posting our finished garments on the blog next week, but if you want a sneak peek, I’m sure something will turn up on Instagram. 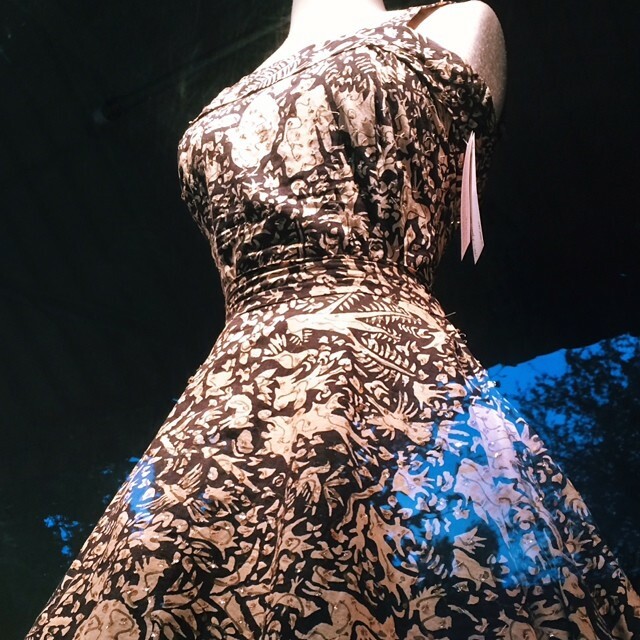 I snapped this shot above of a 1950s batik sundress in the window of Xtabay the other evening. That fabric! One of my favorite tutorials I dug up from the archives this week: Use a pin to fold bias tape. Asking the question “is this too good to be true?” can be a method for acting responsibly. Check out some beautiful finished Monetas from our sewalong! Devon really did a bang up job teaching this sewalong and I can’t wait to harass her into doing more. You can take the break before you need it. There’s always something to learn! Jacqui writes about learning from a challenging public speaking experience at Britex. Some interesting reasons American-made swimwear is actually pretty easy to find! Good luck in your race today! I love the idea of taking a break before you need it. This is something I seriously need to learn. Thanks for sharing. thank you for sharing links to TAE! such a great roundup!